With no reason to go to Boza today I decided to do what I had hoped to do for some weeks now and visit the school down the road at Choba, the one with the Norwich City Fans. I must have said somewhere that this is funded by a British Registered Charity organised by a lady called Valerie McGivern, who has a home in Choba village. I rang Valerie yesterday saying my time was now free and she invited me round to the school this morning. As far as I can work out, the school started about four years ago with Standard 1 pupils and has then grown as this first intake has grown up and at the end of this year has Standards 1,2,3 & 4 and classrooms are nearly complete for 5 & 6, which will give them a year’s grace before they need a new classroom for what will be top class at Standard 7. 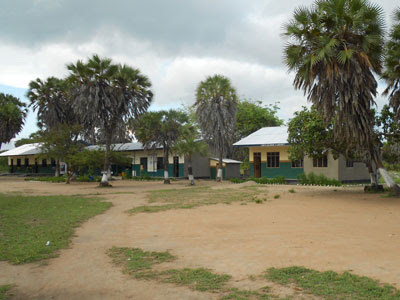 Sometime during this period a nursery school has been started as well in another part of the village. I cycled round and arrived at the school just as the pupils were completing their chores of cleaning, sweeping and general tidying and whilst this was going on, the headteacher, Tim, who I had already met at the YMCA, and one of his colleagues showed me around the school. We arrived back at the front of school in time for the pupils to line up for their morning assembly. It looks very regimented and one thing I haven’t really mentioned is that Boza is the same. At Boza whichever prefect is responsible that day, calls the school to order and there follows a few drills of, “Attention, At ease, attention etc.” interspersed with “Right turn!”, “Left turn!”. Choba was exactly the same with one of the older girls calling the orders. A flag party then assembled from various parts of the arena, with little 8 and 9 year olds marching with Sandhurst precision and stamped turns, after which the whole school sang both the National Anthem and also Tanzania, Tanzania. I roughly know the words to the latter now so I clasped my hand over my heart and sang along with them. Tim then spoke to the school and introduced me to say a few words as well, which I did, resisting the temptation to show off my Swahili because of the visible signs to discourage this. Many of the children recognised me from the YMCA and also from the early morning bus, so there were a few smiles around. At the end of the proceedings the drums struck up again and the various forms marched away to their classrooms until finally the ‘Mace Holder’ dismissed the drummers. I asked Tim a few questions about the school, especially the instruction to speak English. 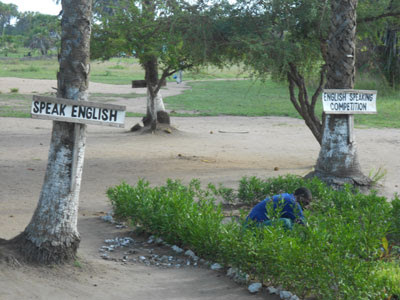 It appears he too shares my concern about the sudden switch from Swahili to English at the end of Primary and start of Secondary education, and sees as one of his responsibilities that pupils are able to do this at as early an age as possible, so lessons at Choba are in English. I was also interested to note that corporal punishment is not allowed in the school and that the threat of their place being removed is enough to handle even the worst excesses. I’ve said before that Choba is a very popular school in the district and has an excellent reputation. This is enhanced by the fact that it takes no parental contribution at all, unlike even the state schools, but I am positive that this is by no means the main reason for its popularity. It will be very interesting to see how well the children do as they progress through the system after such a positive start. The school was preparing for their presentation day on Friday so once the children had returned to their classes I didn’t hang around and returned to the YMCA, only to find that I couldn’t get away from kids. 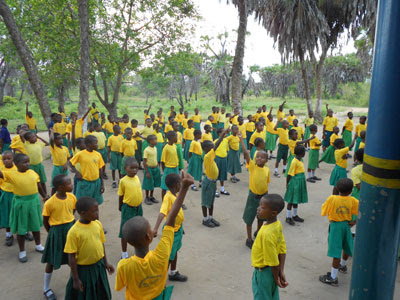 We had an invasion of children from one of the primary schools in Tanga, obviously, from the appearance of the staff, run by the Indian community, although the children were very multi-ethnic. They had come over for a picnic in a bus and a couple of Daladalas and quickly donned their swimming gear before disappearing down to the beach to play in the water. They then eat their packed food before running their energy off in the grounds and playing group games, one of which looked very much like a Tanzanian version of ‘The farmer needs a wife’. An ideal setting but one where, once again, I thought the camera would be an intrusion. As I staying out of the sun as much as possible this week, the rest of the day passed under shade, reading and working on my laptop. Nothing more to report.